24TH POL'AND'ROCK FESTIVAL - When people think of summertime music festivals, they usually think of late-night concerts and living under field conditions. Festival promoters received first positive feedback regarding medical and first aid facilities at Pol'and'Rock Festival 2018. Medical specialists from Kostrzyn nad Odrą hospital are satisfied with first aid and medical facilities planned for this year's edition of the festival. 12th blood drive at Woodstock Festival Poland has resulted in 1576 donations and 709 litres of blood have found its way to blood banks and hospitals in the country - thank you, everyone, who donated! The festival is not over, not really. As the revellers begin their way home, they take a bit of that unique festival feeling on the road with them. Let us repeat our old adage - be safe and look out for each other on your way home! The barriers surrounding the arena in front of the Main Stage of Woodstock Festival Poland have been gradually dismantled allowing for an unobstructed flow of people enjoying the concerts of the last day of the festival. Don't let us down and follow our Rules & Regulations. It's official - we are safe! We are all keeping Woodstock Poland safe! You are our top priority! That is why as long as we play we will keep banging on about keeping safe. We keep on training, practicing and improving to make sure we can keep you safe no matter what. A safety drill involving all rescue services and Peace Patrol took place at the festival field today. Just like every year Peace Patrol will be helping you find all your lost belongings. Keep on reading to find out how to keep your stuff safe and where to look for it if it goes missing. Medical Partol ready for action! 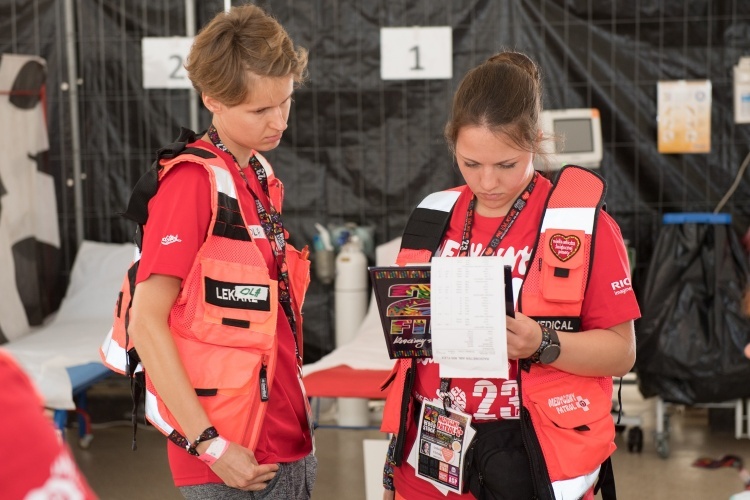 Woodstock Festival Poland is a massive open air event, and the event organisers are working to ensure that the participants of the festival can seek professional medical help from the festival medical services, known as the Medical Patrol. The festival is waiting for you - arrive safely! We are just 2 days away from the launch of Woodstock Festival Poland! Our vibrant festival field is slowly but surely filling up with people. If you are still unsure about how to get to the festival site, read on for tips from seasoned festival-goers. We create this festival with an aim of making it as open and accessible for everyone as possible. Frist of all, the festival is completely free. We also work hard to make it accessible for people with disabilities. Dr Dietmar Woidke, the Minister President of Brandenburg and serving member of Committee on Foreign Affairs, where he is responsible for German-Polish cross border partnership has made a statement on Woodstock Festival Poland. Woodstock Festival Poland is a family friendly event, with lots of interesting and educational activities for the youngest attendees. This is a massive public event, however, and you should follow our tried and tested advice!